Protect your carpet from debris and moisture in high traffic areas with these heavy-duty clear PVC runner. Clear Trax™ Vinyl Floor Mats are a durable, economical approach for any office, municipality or school. The ribbed top surface provides supreme traction and durability. Mini-spikes underneath the mat grips the carpet and minimizes mat movement. 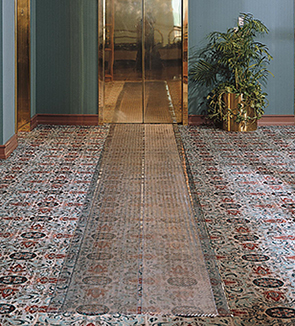 These runners are recommended for temporary or permanent use on looped pile carpeting. Heavy duty clear PVC ribbed top runner. Mini-spiked underside clings to carpet. Overall thicknes is 1/8 inch.